Riley Winebarger, 12, lay on the grass in her South Austin front yard while a pug tore around her in circles. She was quiet and relaxed while the dog snorted and panted and pulled at the leash she was holding. A few steps away, her family's two rat terriers, Tater Tot and Cooper, stood quietly looking at her. "She's our own neighborhood dog whisperer," said Helen Lemm, a psychotherapist who lives nearby. 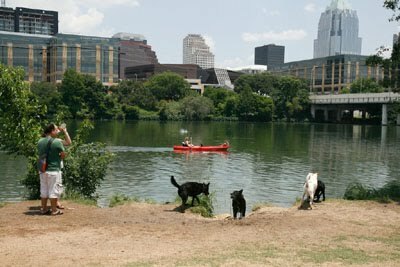 Riley gets a call at least once a week from someone in her neighborhood near Zilker Park wanting her to pet-sit, said her mother, Susan Winebarger, a retired nurse who screens the calls. A small sign stuck amid plants in the family's front yard says: "Winebarger girls. Babysitting. Petsitting. Car detailing." The seventh-grader at O. Henry Middle School said she began her pet-sitting business two years ago because she wanted to earn her own money, but she was too young to take care of children as her big sister Erin, who has the baby-sitting and the car-detailing businesses, did. Riley said she charges $5 to $10 a day for her pet-sitting services, but she usually gets more in tips. A petite girl with a shy smile, Riley said she takes care of animals in only her neighborhood and fits her business into her other interests, such as working on a black belt in karate. Riley said her business doesn't just include dogs and cats. "I pet-sit a red-eared slider turtle named Scratchea that ran away from its pond," she said. "I put treats all over the yard, and it came back four or five days later." She especially likes dogs, she said. "They have such relaxed personalities and kind of calm me down," she said. "They are just goofy and funny." Riley once took care of a rat terrier named Chester that Lemm had rescued, Lemm said. "He had been abused on the streets, and he was generally hypersensitive to people, but he could sense that Riley is an open-hearted, gentle little girl," Lemm said. Patti Aleman, a nurse practitioner who lives across the street from Winebarger, said Riley charged only $5 a day to water plants, bring in the mail and feed Aleman's cat, Chloe, twice a day. "You can't beat that," Aleman said. Zilker Elementary School teacher Lindsey Gaddis, the owner of the pug — also named Cooper — said Riley was the first person she trusted to watch her dog. "She's eager, and the first time I went over to her family's house to see if she would mind taking care of Cooper, I ended up staying for two hours," Gaddis said. Riley said she was able to buy a video iPod this summer with money from her business and now has saved more than $100. She has always loved animals, her mother said. "She called me laughing once after she got bit by a boa constrictor at a birthday party," Winebarger said.